Hinting at status quo on policy rates, the RBI today said its immediate focus was to stabilise rupee and made a case for calibrated action to contain the current account deficit (CAD), which is a major reason for the steep fall in currency. The Reserve Bank of India is scheduled to review the monetary policy on Tuesday. Ahead of the RBI's quarterly monetary policy review, the rupee today snapped three days of gains and closed 37 paise lower, the most in a week, to 59.41 against the dollar. Capital market regulator SEBI today tightened disclosure norms for hedge funds and other Alternative Investment Funds (AIFs) using complex trading strategies, especially for those leveraging investments for higher returns or borrowings. Continuing its downward march for the fourth session, the benchmark S&P BSE Sensex today tumbled 155 points to end at a nearly three-week low of 19,593.28 on the eve of the RBI's monetary policy review. The Supreme Court today issued notice to the Centre, Reliance Industries Ltd (RIL) and four others, seeking their response to a PIL pleading for quashing the government’s decision to double the natural gas price from $4.2 per million British thermal unit (mbtu) to $8.4 per mbtu from April 2014. Reliance Telecom Ltd (RTL) today contended in the Supreme Court that the CBI had sought to make Reliance ADAG chairman Anil Ambani and his wife Tina as witnesses in the trial court in a desperate attempt to revive its 2G scam case. “It should be the funeral of the case when the prosecution has been unable to prove its case after examination of 140 witnesses” in the trial court, senior counsel Mukul Rohatgi pleaded. The RBI’s decision to tighten gold imports is squeezing small jewellers across the country who are being forced to cut corners, according to traders. As per traders at Zaveri Bazaar and Opera House, the hub of India's gold and diamond trade, jewellers are being forced to source gold from the grey market. "With not enough gold available for jewellers, people are resorting to alternative modes of supply," says a trader at Zaveri Bazaar, who does not want to be named. Restrictions on gold imports will continue following a surge in inward shipments of the metal in July after moderating in the previous month, Finance Minister P Chidambaram said today. Bharti Infratel, the tower arm of telecom major Bharti Airtel, today reported a 67.6 per cent jump in net profit at Rs 357.6 crore for the first quarter ended June 30, 2013. "The priority for monetary policy now is to restore stability in the currency market so that macro-financial conditions remain supportive of growth. (However) this strategy will succeed only if reinforced by structural reforms to reduce the CAD and step up savings and investment," RBI said in its macroeconomic and monetary developments review released on the eve of the policy announcement. "Amplifying macro-financial risks warrant cautious monetary policy stance," it added. A survey of external professional forecasters done by RBI increased its median expectation on rupee value to the 59.5 level to the dollar by March 2014 - nearly the same level at which the domestic currency is now trading. This is compared to the earlier expectation of 54. A majority of RBI watchers expect the policy to be a "no show" event, but are looking forward to the guidance which Governor D Subbarao gives in the quarterly policy announcement, which would be the last before he demits office early September. The depreciation in the rupee, which has shed over 10 per cent this fiscal, will weigh heavy on RBI, they said, adding that this is a shift from the central bank's focus on bringing down inflation and propping up economic growth. "While monetary policy is largely guided by the growth-inflation dynamics, it is also tempered by considerations of risks of external imbalances," the report said. Depreciation in the rupee to a record low of 61.21 against a dollar has forced the RBI to take some unconventional measures to curtail liquidity and curb speculation in the past fortnight. Flagging consumer price inflation, which has been constantly hovering in the double digits for the past 15 months, even though wholesale price index has eased, it said the high retail inflation number puts pressure on public finances and erodes domestic savings, which in turn widen CAD. The CAD will improve only on structural reforms, it said, adding that CAD is expected to come lower in FY14 than the 4.8 per cent last fiscal. However, the 3.8 per cent achieved in the last quarter of FY13 is likely to be breached in the June quarter, it said. On the growth front, RBI raised concern saying that the recovery is likely to be slower. "The pace of recovery is likely to be slow in view of the structural constraints," RBI said, adding that the recovery will come in the latter part of the fiscal on the back of a good monsoon. The currency also declined amid fresh month-end dollar demand from importers and a drop in local stocks. A weak dollar overseas ahead of the US Federal Open Market Committee meet this week and fresh capital inflows restricted the rupee's fall, a forex dealer said. At the Forex market, the rupee opened lower at 59.10 a dollar from the previous close of 59.04. After touching a high of 59.08, it declined to a low of 59.45 and settled at 59.41, a fall of 37 paise or 0.63 per cent. The rupee last fell by 37 on July 22. Such funds have been asked to have a comprehensive risk management framework and a strong compliance function as per their size, complexity and risk profile. They have also been asked to maintain appropriate records of their trades and provide full disclosure of their trade management practices and any conflict of interest to SEBI. The directions have been made by SEBI through its 'Operational, Prudential and Reporting Norms for Alternative Investment Funds (AIFs)', which were introduced by the regulator last year as a separate product class. The AIFs have been divided into three categories. The category I AIFs include those investing in start-ups, social ventures, SMEs, infrastructure or other areas that can get government incentives for being 'socially or economically desirable'. The category II AIFs include private equity funds and debt funds which do not get any incentives or concessions from the government and do not undertake leverage or borrowing other than to meet day-today operational requirements. The other AIFs have been placed under Category III and they employ "diverse or complex trading strategies and may employ leverage, including through investment in listed or unlisted derivatives". These include hedge funds or funds which trade with a view to make short-term returns. SEBI today said category III AIFs, which undertake leverage would need to submit a report to SEBI on a monthly basis about their activities. The others who do not undertake any leverage can, however, submit such reports on a quarterly basis. The index fell on selling in FMCG, PSU, metal and realty stocks, while weak Asian cues amid mixed European openings also weighed on market sentiment. The 30-share Sensex initially touched a high of 19,751.03 and then declined on weak Asian trends to settle at 19,593.28, a fall of 154.91 points or 0.78 per cent. That was the lowest close since 19,294.12 on July 10. The National Stock Exchange's Nifty index fell 54.55 points, or 0.93 per cent, to 5,831.65. The SX40 index on the MCX-SX closed at 11,695.58, down 0.81 per cent. The PIL has been filed by CPI leader Gurudas Dasgupta, an MP, and former Union Power Secretary EAS Sarma, contending that the hike would result in a “massive hike in power tariffs and fertiliser costs,” besides benefiting RIL at the cost of poor people and the government. The other respondents to the PIL are Petroleum and Natural Gas Minister M Veerappa Moily, the ministry, NIKO Resources Ltd, a company registered in Canada, and BP Exploration (Alpha) Ltd. A Bench comprising Chief Justice P Sathasivam and Justices Ranjana Desai and Ranjan Gogoi passed an order asking them to send their response within four weeks. The case would be taken up for next hearing on September 6. Appearing for the petitioners, senior counsel Colin Gonsalves said Moily “is batting for Reliance” by ignoring the formula suggested by the Rangarajan committee and over-ruling the views of the officials. Senior counsel Harish Salve, arguing for RIL, questioned the logic behind the PIL at a time when the dispute relating to recovery of the investments made by the company in gas exploration and production under the production sharing contract (PSC) for the Krishna-Godhavari Delta block (KG-D6) had gone for arbitration. The Bench, however, said it was not inclined to reject a senior MP’s PIL at the initial stage. Dasgupta said he was forced to file the PIL as Prime Minister Manmohan Singh had failed to respond to his letters on the issue. The ministries of fertilizer and power had opposed the price hike. RIL stood to gain by Rs 81,000 crore from KG-D6 in just five years from April 2004 following the hike, the petition said. Further, the present government had no right to place such a huge burden on the nation at the time of Lok Sabha elections due early next year, it contended. 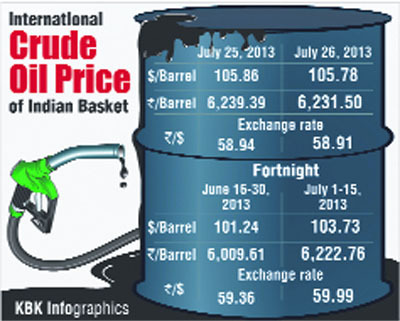 The PIL has also sought pricing of gas in rupees instead of in dollars or any other currency. Pending the price hike in April, the production at KG-D6 had been brought down from 42 mmscmd in 2011-12 to 25 mmscmd in 2012-13. In view of this, the government should not allow cost recovery to the extent of $2.7 billion, the petitioners pleaded. The trial court’s July 19 order summoning Anil and Tina would also prolong the trial which was against the SC order for expeditious disposal of the case, he said. Instead of focusing on additional witnesses, the trial court should examine the remaining 20 witnesses named in the charge sheet, he pleaded. The RBI’s decision to tighten gold imports is squeezing small jewellers across the country who are being forced to cut corners, according to traders. As per traders at Zaveri Bazaar and Opera House, the hub of India's gold and diamond trade, jewellers are being forced to source gold from the grey market. "With not enough gold available for jewellers, people are resorting to alternative modes of supply," says a trader at Zaveri Bazaar, who does not want to be named. The suppliers are often big established traders with operations in the Middle-East linked to the underworld. Another prominent trader from south Mumbai said jewellers are likely to pay their suppliers in rupees with the money transferred out of the country via the hawala route. Indian jewellers are offering to pay a premium of up to US $20 per ounce, but no supply is forthcoming, said Bachchraj Bamalwa, director, All India Gems and Jewellery Trade Federation. The World Gold Council said recently that smuggling of gold could go up from 102 tonne last year to 140 tonne this year. However, traders expect the smuggling to go up sharply ahead of the festival season, which begins next month and goes on up to November. Reports say the Dubai mafia is paying as much as Rs 1,000 per 10 gm to carriers who use different methods to smuggle the yellow metal into the country. Traders admit that customers who are forced to buy jewellery items from small players could stand to be conned by unscrupulous elements. "Small jewellers who are sourcing gold from the grey market may not hallmark their jewellery or illegally blend in cheaper metals," says a jeweller. Sources in the industry also warn that jewellers sourcing gold from the grey market may not provide genuine bills to customers under the pretext of saving Value Added Tax and other duties. "In such a situation, a customer stuck with spurious gold jewellery will have no legal options," says another jeweller. Meanwhile, the jewellery market is abuzz with rumours that the RBI may make the sale of gold coins and gold biscuits illegal. "Imports were low in June but in July it has turned again...in July the imports have risen, therefore those measures (to contain imports) will continue," Chidambaram said at a function here. Gold imports were 141 tonnes in April and rose to 162 tonnes in May. "About 302 tonnes of gold was imported in two months. If we multiply it by six, then 1,800 tonnes of gold is to be imported (in the fiscal). So where is the money to import 1,800 tonnes," he asked, justifying steps taken by the government and the RBI to curb gold imports. While the government increased customs duty on gold to 8 per cent, the RBI imposed a series of restrictions on import and financing of gold. The minister said India imported 845 tonnes of gold in 2012-13 for which the nation had to shell out $50 billion (about Rs 3 lakh crore) in foreign exchange. The total income of the company during the quarter under review stood at Rs 2,622 crore as against Rs 2,416.6 crore for the same period a year ago. Reliance Capital on Monday posted a nearly three-fold rise in consolidated net profit at Rs 133 crore for the first quarter ended June, 2013 on the back of all-round growth. The total income of the company rose to Rs 1,930 crore in the quarter, against a total income of Rs 1,662 crore in the year-ago period, an increase of 16 per cent. Punjab & Sind Bank today reported over 5-fold jump in profit at Rs 121.71 crore for the first quarter ended June, 2013 on account of treasury profit and improvement in margins. The bank had earned net profit of Rs 24.03 crore in the April-June quarter of 2012-13, PSB said in a statement. The total Q1 income rose to Rs 2,000.15 crore, from Rs 1,844.15 crore in the year-ago period. According to PSB Chairman and Managing Director D P Singh, the bank expects net profit growth of 40-50 per cent while total business is likely to see a growth of 25 per cent in the current fiscal. FMCG major Colgate Palmolive India today reported a 57.74 per cent increase in net profit at Rs 185.22 crore for the first quarter ended June 30, 2013, on account of 9 per cent volume growth during the period. Net sales of the company rose to Rs 844.62 crore for the fisrt quarter, as against Rs 736.08 crore during the same period of previous financial year, Colgate Palmolive (India) Ltd said in a filing to the BSE. Allahabad Bank today reported a 19.6 per cent fall in net profit at Rs 413 crore in the first quarter ended June 30, 2013, due to higher provisioning. The state-owned bank's net profit stood at Rs 514 crore in the corresponding period of the previous fiscal. However, operating profit of the bank during the reported quarter increased seven per cent at Rs 1,022 crore as against Rs 956 crore in the previous corresponding period. Country's largest cement maker Ultratech today registered a 13.49 per cent dip in net profit in the first quarter at Rs 673 crore on lower sales and higher raw material expenses. Net sales of the company also declined to Rs 4,958 crore in the April-June quarter from Rs 5,072 crore a year ago. IDFC Limited today said its consolidated net profit rose by 46.9 per cent to Rs 560.73 crore in the first quarter ended June 30, 2013.